We're Offering Up To five Slots For Solo Artists Or Bands. Simply send us a link to your video online via the form below. If you don't have a video yet or you're working on a new one, there's still time. The window for submissions closes at midnight May 31st 2019. While we look forward to seeing your work, unfortunately we cannot reply to all applicants. 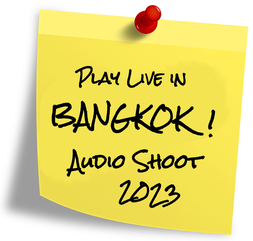 The winning artists/bands will be announced here on Audio Shoot Unsigned shortly after the submission deadline. Our event is brand new and so are our Social Pages. Give us a hug on Facebook or Instagram by liking and sharing and you could win two weekend tickets to Audio Shoot Unsigned 2019. We're giving away three sets of tickets and winners will be contacted well in advance of the event. By liking and sharing you accept that if you win, your name may be displayed.